For the Chinese in the past, the Winter Solstice marks the arrival of winter proper, falling on either 21st or 22nd of December every year. It is an important day in the lunar calendar and for some, even more so than Chinese New Year itself. Despite being in the tropical Malay Archipelago which knows no seasons, Peranakans from the region stretching from Thailand, to Malaysia, Singapore and all the way down to Indonesia celebrate this important day as “Tang Chek” (“冬至” in Hokkien) with worship and good food. Tang Chek also marks the beginning of a two-month long process of preparatory work which leads up to Chinese New Year （Taon Baru Cina) itself, ending the festivities on Chap Goh Meh (“十五眠” in Hokkien） which mean literally the 15th day of the 1st lunar month. Despite being “orang cina, bukan cina” the Peranakans follow the very many traditions set forth by their ancestors who brought along these beliefs and practices from China to the Straits many generations back. The practices observed during Tang Chek by the Peranakans have their roots deep within Chinese culture, and interestingly some of which have long been abandoned by the Chinese themselves. Kueh Ee is symbolically associated with Tang Chek though not exclusively. It is also used in the worship of the Kitchen God, known as the datok dapor to the Peranakans or 灶君/灶神/灶王公 to the Chinese from various dialectal backgrounds, about a week before Chinese New Year on a day known as “ari datok naik” to literally mean “the day the God rises”. Legend has it that the Kitchen God returns to the heavens on this day to report to the 玉皇大帝 Jade Emperor or better known to the Hokkiens and Peranakans as “Tee Kong” 天公 on the events which occurred on Earth during the past year. 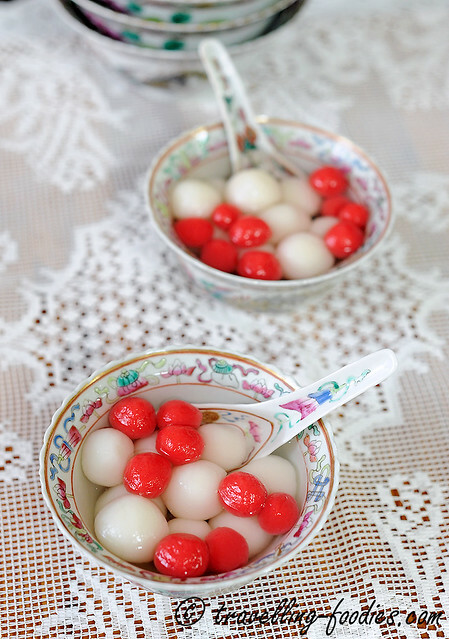 Thus, to prevent the Kitchen God from saying too much, especially the ill-happenings and gossips within the family, these sticky glutinous rice balls are used to seal the Kitchen God’s mouth. And the accompanying sugary broth cooked with pandan leaves ensures that whatever that escapes from the Kitchen God’s mouth would be sweet talk as well! In some Chinese communities, a cooked glutinous rice ball would be ceremoniously plastered onto his mouth on the Kitchen God’s portrait or on the wooden tablet bearing his name to ensure that the plot is fail-proof! On Chap Goh Meh, kueh ee is also eaten and offered, marking an end to the Chinese New Year celebrations and bringing it to a resounding finale. Once again, the symbolic act of togetherness and completion is expressed for all these festivities which begin with kueh ee and ends with it as well. 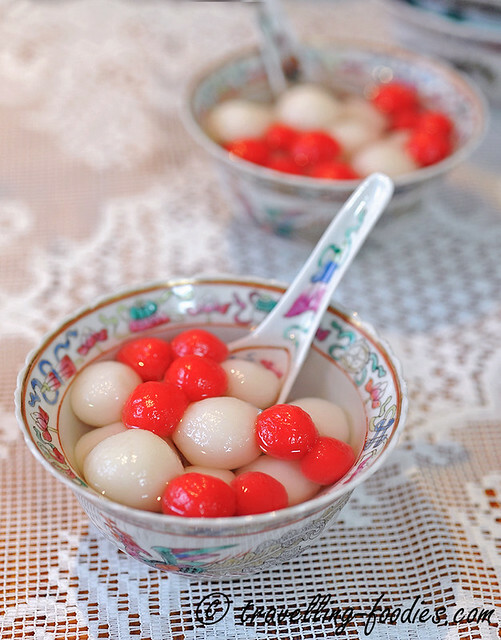 In the past, kueh ee came in various colours but over time, red and white seem to be favoured by most Peranakans and became the cultural norm. While the younger generation have shifted their liking to something more demure and soft like pink, it is generally frowned upon by the older folks. Only those made in bright gaudy red would be met with smiles of contentment and garner nods of approval. This insistence is also perpetuated in the form which kueh ee takes. 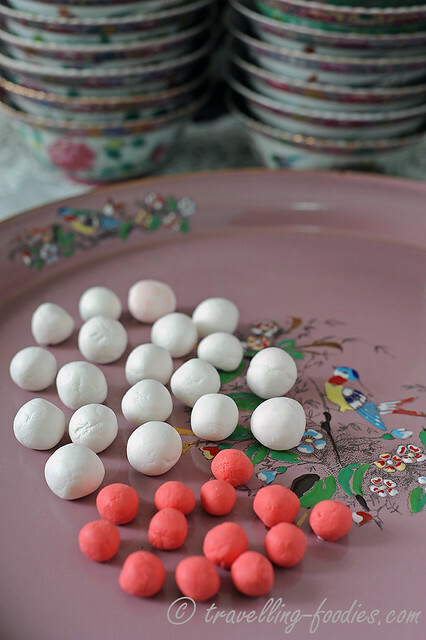 Traditionally, these glutinous rice balls come without filling and still remains largely so with the Peranakan community. But as cultures mingle and intertwine, more and more folks are more receptive to those with sweet filling of red bean, ground peanut and black sesame which seem to have stemmed from other Chinese culinary practices, e.g 粤式糖水 Cantonese style tong shuei, i.e. sweet broth desserts. But all is not lost by making them inti kosong! The most commonly observed and amusing practice with kueh ee is for one to eat the same number as one’s age! But imagine an old bibik well into her seventies stuffing herself crazy with these glutinous rice balls only to lament later on. “Aiyoh gua mia dada tak siow skali…gua pi cekik tu semua lah…sial lah!“(I am suffering from indigestion! To think that I ate it all! Oh unlucky me!”)… much to the amusement of her grandchildren for sure! So the clever Peranakans found a way to get around this problem of having to eat too much but “downsizing” their kueh ee and make them really dainty. This is a mere perpetuation of their art of making nyonya kueh as well, like ondeh ondeh and rempah udang which are all made to become bitesize finger food, compared to their more boisterous-by-comparison Malay or Indonesian counterparts. So with kueh ee made so petite, one could in actuality eat the same number as one’s age afterall, though I’m pretty sure no one does that anymore! Or risk the lamentation as the old bibik did! After washing hands thoroughly, prepare glutinous rice dough by first adding a portion of tepid water to glutinous rice flour in a large bowl and mixing well to incorporate. Gradually add more water until “play dough” or “soft clay” texture is achieved. To make kueh ee, divide the glutinous rice dough into three portions. To one portion, add a small amount of red food colouring. Pinch and divide the dough into small clumps and proceed to roll them into small balls between your palms. You can also shape the dough between finger tips if they are too small. Bring a pot of water to a gentle boil. Lower white dough balls first into the water slowly and stir gently to make sure that the balls do not stick to the bottom of the pot. Remove the cooked glutinous rice balls from the boiling water when they float with either a slotted spoon or small wired sieve into a separate bowl of water at room temperature. Repeat the cooking process with the red dough balls. To a pot, place water, sugar and pandan leaves and bring the mixture to a boil. Cover with lid, lower flame and let the mixture simmer for another 5-10 min for the fragrance of the pandan leaves to infuse into the sweet broth. 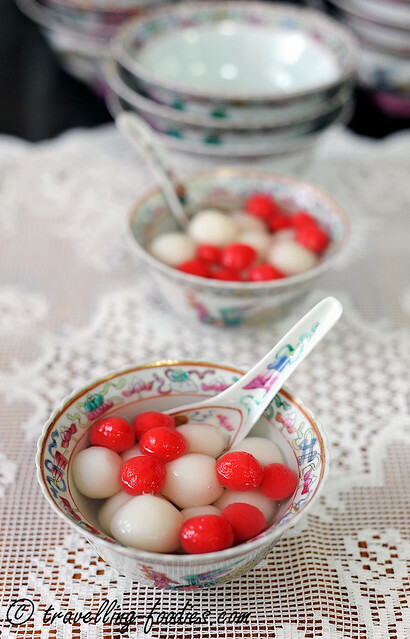 To serve, place a portion of both white and red glutinous rice balls into dessert bowls. Ladle the sweet broth over the kueh ee. Serve immediately. Slamat ari Tang Chek Everyone! This entry was posted on December 20, 2013 by Alan (travellingfoodies). It was filed under Food, Simple Eats and was tagged with chinese peranakan, dessert, kueh ee, kuih ee, Nyonya, tang chek, Tang yuan, winter solstice, 冬至. oh love the traditional bowl you have there, makes it really pretty with the Kueh Ee! I too, made a point to cook Ee every year ever since I moved out from the country just so I can make up for the misses I have for home. Btw, I love your blog very much. Wishing you a good new 2014 year ahead!